1) It's too early to be awake. --------> I love starting my morning with pumpkin coffee! 2) Boo to the morning commute! --------> The sunrise over the bay is breathtaking! 3) 4th graders are whiny! --------> 4th graders make me laugh. 4) It's too chilly to walk the dog. --------> Hooray for fuzzy socks! It's not always easy to look on the bright side, but even a little effort diminishes the not so awesome in our days. 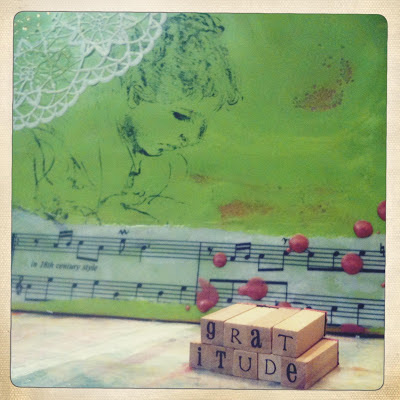 Make a little room in your heart for the creative and transformative practice of gratitude. Ugh the drive to work is boring.....but at least I didn't get stuck behind a tractor or a combine again. My studio looks like a bomb went off in it.....Oh well I've made some really pretty things this week....maybe the mess will clean itself! hehe! Giggle I did! That's exactly what I mean. We can learn to catch ourselves when the negative thoughts form (which they inevitably will) and reframe them into something positive or even comical. I think being able to laugh at ourselves is one of life's greatest skills.